Whenever my husband asks what I want for my birthday or Christmas, I usually say nothing. I'd much rather go do something, go out to a good dinner, or spend some family time together. However, this year when he asked me I quickly said "a Kitchen Aid Mixer - the Pro 600 with a 6qt bowl." He wasn't expecting anything from me, yet alone that! See, I don't bake and I've always said that I don't have a need for a fancy mixer. But over the past year or two I have started to think more about it. Last year I made several kinds of cookies for Christmas and my little $10 hand mixer just didn't cut it. I'd also like to try my hand at bread, dough, and think that I would enjoy baking more if I had a mixer that did a lot of the hard work for me. So the morning of my birthday I opened the box and there it was. Well, I was actually home when the FedEx guy delivered it 2 days prior so I knew what would be in the box, but I was still so excited to finally open it. What a beautiful piece of machinery it is! I hate clutter, but this baby will definitely have a spot to sit on my counter. Plus, who the heck wants to lug 29 lbs around every time you want to use it? I've had the mixer for 2 weeks now and have used it 4 times, including making a great cake for my husband's birthday (see, the gift that keeps on giving!). But how fitting that the very first time I used it, just about 5 hours after opening the box, was to shred chicken?? 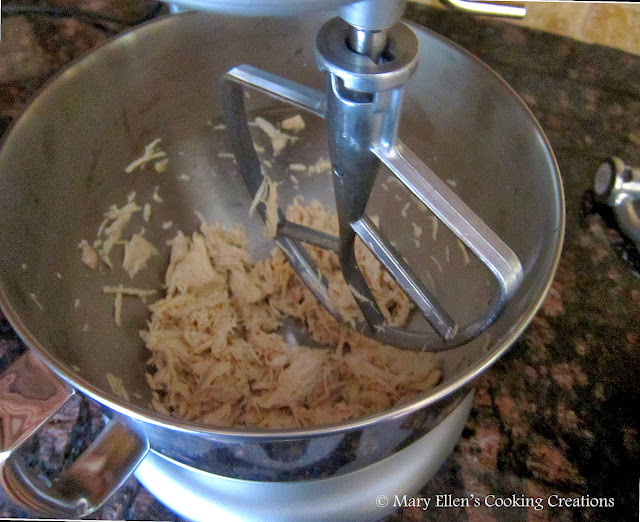 I had heard that you could shred chicken in this mixer but after looking at the attachments I thought "yea, right." I put the cooked chicken breasts into the mixer and turned it on low and holy crap, it started to shred!! I kept watching in awe as it perfectly shredded my chicken - I think this is my favorite use so far! Goodbye are the days of spending 10-15 minutes with two forks and tired arms! I used the shredded chicken in a deliciously hearty Chicken Corn Chowder that I first saw on Buns in My Oven - to be honest, her picture is what first got me! I changed a few things up, added a few things, and was so happy with how it turned out. Now if I only had some homemade bread to go with it... next time!! Heat a Dutch oven or heavy stock pot over medium high heat. Add the bacon, and cook until crispy. Transfer to a plate covered with paper towels. Crumble. 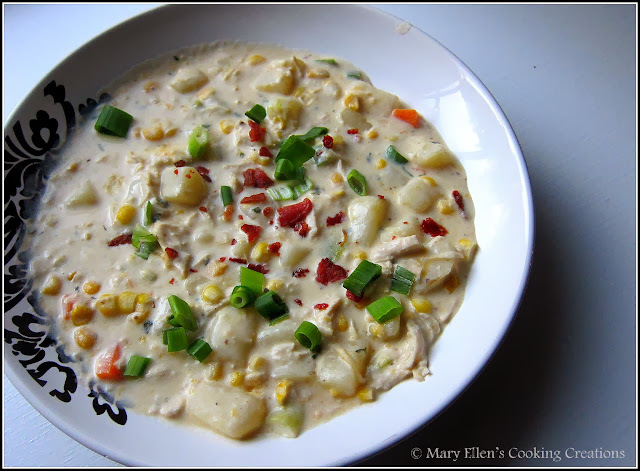 To the pot with bacon grease add the potatoes, white parts of green onion, carrots, celery, jalapeno, butter; stir. 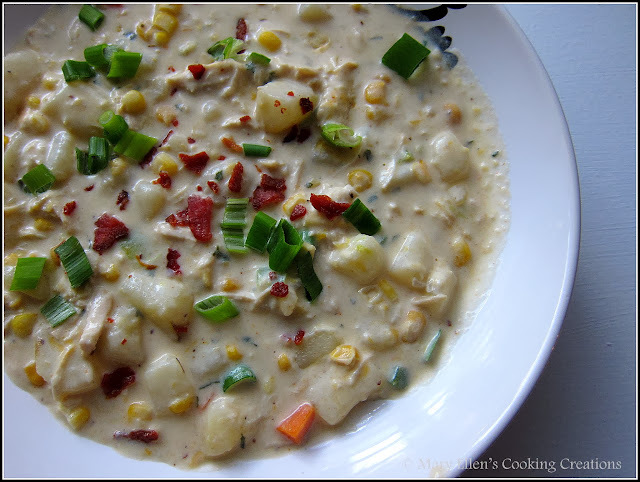 Add creamed corn and frozen corn; stir.